Designed to work with STI Wireless Receivers, the STI-6402WIR wireless alarm is designed for double doors. The device alerts you to any unauthorized exits/entries through emergency exit doors and rear doors. The device serves as an inexpensive security device and helps stop theft as well. The STI-6402WIR is designed for double door installation and includes a double reed switch assembly. 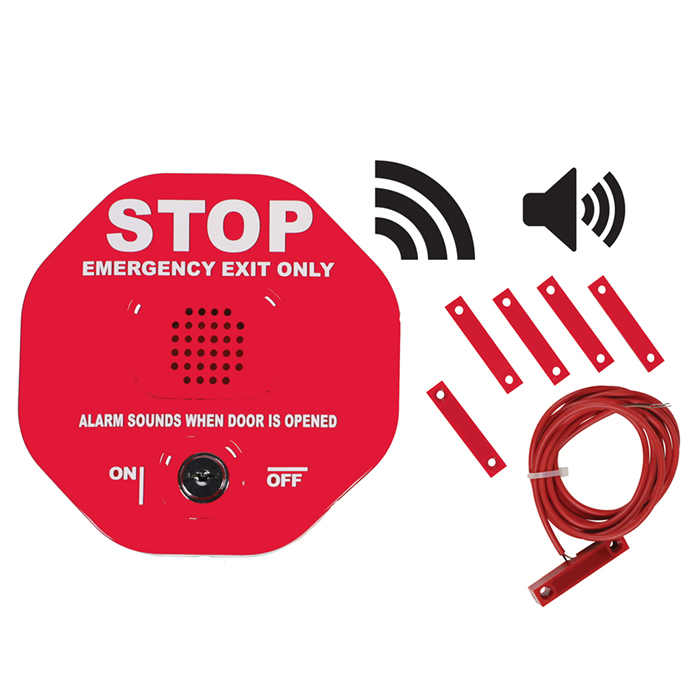 If the protected door is opened, the electronic Exit Stopper emits an ear piercing alarm for 30 seconds, three minutes or continuously (as preset by the user) and transmits a signal to an STI receiver (sold separately). A key operated override will silence the alarm and allow authorized exits. The STI-6402WIR also provides the option to operate in annunciator mode. In this mode it announces a doors opening with a set of 10 beeps and then resets. Exit Stopper is fitted with a long life 9-VDC alkaline battery. Supervised wireless 433mhz (requires STI-V34104 4-Channel Receiver or STI-34108 8-Channel Receiver). Includes double-reed switch assembly to monitor double doors. Up to 1000'' (line of sight) range. User can select whether to use as an alarm or annunciator. Recommended operating temperature 32°F to 120°F (0°C to 49°C).